Angel Soft ps Ultra™ facial tissue offers premium softness and quality for at-home comfort away from home. This premium soft, 2-ply white facial tissue offers a solution for facilities looking to enhance image. 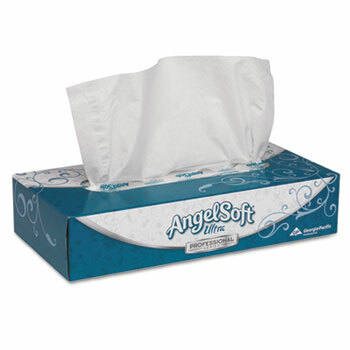 Your guests will be truly touched when they discover Angel Soft ps Ultra™ facial tissue among their amenities. This facial tissue brings an added touch of luxury to our premium line. Perfect for use in luxury hotels, fine dining, top casinos, and executive offices. Contain different colored indicator sheet that alert when a new box is needed. White. 7.4 x 8.8" sheets. Flat box. 125 sheets per box. 30 boxes per case.